In its natural habitat in Homer, Alaska in the USA, a Bald Eagle flies just above the surface of the water with a backdrop of the snowy mountains, a sign winter is arriving. As the snowy mountains surround the waters in Homer, Alaska, a Bald Eagle soars above the surface of the icy cold waters as the sun tries to break through the thin layer of clouds. With wings fully extended upwards while flying about its natural habitat of Homer, Alaska, these large birds can reach speeds of between 35-44 miles per hour. In a perpendicular form, the Bald Eagle has its talons tucked under its white tail feathers with its white head and yellow hooked beak remaining stationary. This creates a spectacular picture while the eagle shows off its beauty while enjoying an afternoon flight. The wingspan on an adult Bald Eagle can be between 72 and 96 inches with the male being slightly smaller in size at 9 pounds and the female reaching an average of 12.8 pounds. Photo of a Bald Eagle in its natural habitat soaring over the cold waters in Homer, Alaska with a backdrop of snowy mountains. 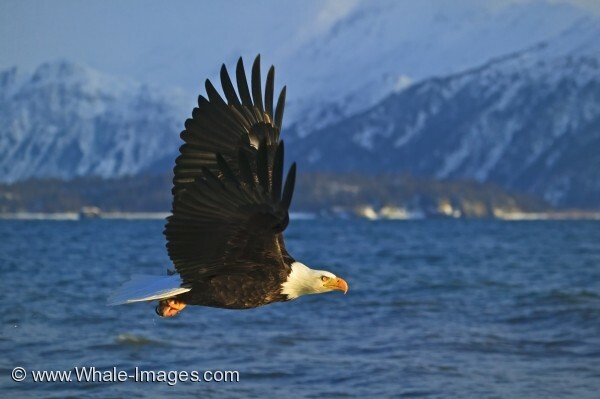 The Bald Eagles return to their natural habitat of Homer, Alaska every winter where they dive into the cold waters in search of fish. As Spring arrives, the fish move on, people arrive and so the Bald Eagles depart Homer, Alaska waiting for the onset of winter before their return. Often they are seen soaring over the snowy mountain peaks, a spectacular sight when more than one takes flight in the area. The Bald Eagle is a symbol of national pride and strength and is known as the national bird of the USA. Bald eagles were rapidly declining throughout the USA in the 20th century and listed as endangered, but due to people getting involved and protecting these spectacular birds, the numbers have increased and were removed from the endangered and threatened species list in 2007. Homer, Alaska is one of the best places in the world for viewing the Bald Eagles and during the winter, the eagles are everywhere making a photographer's job easier.